...... And the day began. The sun was shining, but there was no sound in the forest. Why? There were no cheerful birds, a wild animal disturbed with something didn't growl, all snakes hided, all insects disappeared, but the birds of prey were flying in the sky. What had happened? It was the beginning of an unprecedented drought, it carried death into jungle. There was no water, the plants were drying up; there was no food and the animals were starving. Their life stopped. It was quiet in the village of prehistoric people. Around the village several monkeys were sitting on the trees exhausted from the heat. Qweas is providing links to Prehistoric Blackjack 1.0 as a courtesy, and makes no representations regarding Prehistoric Blackjack or any other applications or any information related thereto. Any questions, complaints or claims regarding this application Prehistoric Blackjack 1.0 must be directed to the appropriate software vendor. 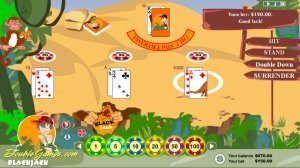 You may click the publisher link of Prehistoric Blackjack on the top of this page to get more details about the vendor.